For a time, front-facing cameras slowly started to fade out of phone specs because video calling started to wane, but since smartphones have entered the scene, Skype (and to some extent Apple’s FaceTime) revitalized the idea of calling people visually with your phone via 3G or WiFi networks. Skype’s popularity of course has come from its desktop roots and netcams, so once everybody got used to the idea, they now wanted a more portable way of Skype-ing. Enter the mobile version of the app, which currently supports video calling on iOS devices, but with version 2.0 for Android, it now is on par with it’s Apple-d up version – or is it? Sadly the new version’s video calling feature only supports four Android smartphones – the HTC Desire S, Sony Ericsson Xperia Neo and Pro, and Google Nexus S. We know – weird. Of course with the amount of device configurations for Android, there are some devices that don’t have a front-facing camera. However, there’s also a lot with built-in front cameras, and they don’t seem to be getting some Skype love. We’re not sure what’s the reason here, and we don’t know why Sony gets double the love, but that’s what it says. Hey, at least some Droid users can finally see each other’s faces! 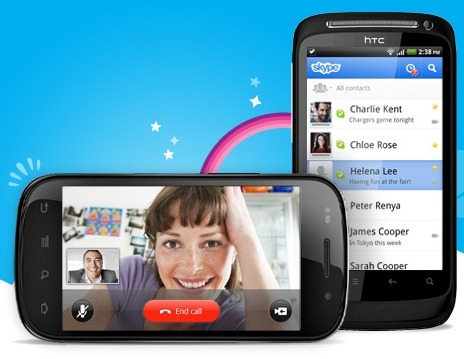 If you’re a Skype-r, you can download the app for your Android phone here. Or you can beam up the bar code below. If you’re one of the video-supported devices, you can also gloat, in video form, about your fancy video calls to the other guys.